DZSWS:1960.8.1 1 Peterborough Ware pottery sherd from West Kennet Long Barrow, Avebury, Wiltshire, excavated by Professor Stuart Piggott and his staff and students at the Department of Prehistoric Archaeology at the University of Edinburgh, 1955-56. DZSWS:1960.8.2 1 neolithic potter base sherd of Windmill Hill ware, decorated with zig-zag and comb impressions, dating to about 2000 BC from the latest period of West Kennet Long Barrow, Avebury, Wiltshire, excavated by Professor Stuart Piggott and his staff and students at the Department of Prehistoric Archaeology at the University of Edinburgh, 1955-56. DZSWS:1960.8.3 1 beaker pottery sherd decorated with comb impressions from West Kennet Long Barrow, Avebury, Wiltshire, excavated by Professor Stuart Piggott and his staff and students at the Department of Prehistoric Archaeology at the University of Edinburgh, 1955-56. DZSWS:1960.8.4 1 neolithic pottery sherd decorated with zig-zag and vertical lines around the rim, dating to about 3000 - 3600 BC from West Kennet Long Barrow, Avebury, Wiltshire, excavated by Professor Stuart Piggott and his staff and students at the Department of Prehistoric Archaeology at the University of Edinburgh, 1955-56. DZSWS:1960.8.5 1 neolithic pottery sherd decorated with impressed cord in spirals on panels, from West Kennet Long Barrow, Avebury, Wiltshire, excavated by Professor Stuart Piggott and his staff and students at the Department of Prehistoric Archaeology at the University of Edinburgh, 1955-56. DZSWS:1960.8.6 3 shells, part of a necklace made of shale, bone and shell, from West Kennet Long Barrow, Avebury, Wiltshire, excavated by Professor Stuart Piggott and his staff and students at the Department of Prehistoric Archaeology at the University of Edinburgh, 1955-56. DZSWS:1960.8.7 1 bone bead, part of a necklace made of shale, bone and shell, from West Kennet Long Barrow, Avebury, Wiltshire, excavated by Professor Stuart Piggott and his staff and students at the Department of Prehistoric Archaeology at the University of Edinburgh, 1955-56. DZSWS:1960.8.8 1 bone bead, part of a necklace made of shale, bone and shell, from West Kennet Long Barrow, Avebury, Wiltshire, excavated by Professor Stuart Piggott and his staff and students at the Department of Prehistoric Archaeology at the University of Edinburgh, 1955-56. DZSWS:1960.8.9 1 shale bead, part of a necklace made of shale, bone and shell, from West Kennet Long Barrow, Avebury, Wiltshire, excavated by Professor Stuart Piggott and his staff and students at the Department of Prehistoric Archaeology at the University of Edinburgh, 1955-56. DZSWS:1960.8.10 1 shale bead, part of a necklace made of shale, bone and shell, from West Kennet Long Barrow, Avebury, Wiltshire, excavated by Professor Stuart Piggott and his staff and students at the Department of Prehistoric Archaeology at the University of Edinburgh, 1955-56. DZSWS:1960.8.11 3 shale beads, part of a necklace made of shale, bone, ivory, tooth and shell, from West Kennet Long Barrow, Avebury, Wiltshire, excavated by Professor Stuart Piggott and his staff and students at the Department of Prehistoric Archaeology at the University of Edinburgh, 1955-56. DZSWS:1960.8.12 1 bone bead, part of a necklace made of shale, bone, ivory, tooth and shell, from West Kennet Long Barrow, Avebury, Wiltshire, excavated by Professor Stuart Piggott and his staff and students at the Department of Prehistoric Archaeology at the University of Edinburgh, 1955-56. DZSWS:1960.8.13 1 ivory bead, part of a necklace made of shale, bone, ivory, tooth and shell, from West Kennet Long Barrow, Avebury, Wiltshire, excavated by Professor Stuart Piggott and his staff and students at the Department of Prehistoric Archaeology at the University of Edinburgh, 1955-56. DZSWS:1960.8.14 1 tooth bead, part of a necklace made of shale, bone, ivory, tooth and shell, from West Kennet Long Barrow, Avebury, Wiltshire, excavated by Professor Stuart Piggott and his staff and students at the Department of Prehistoric Archaeology at the University of Edinburgh, 1955-56. DZSWS:1960.8.15 1 shell bead, part of a necklace made of shale, bone, ivory, tooth and shell, from West Kennet Long Barrow, Avebury, Wiltshire, excavated by Professor Stuart Piggott and his staff and students at the Department of Prehistoric Archaeology at the University of Edinburgh, 1955-56. DZSWS:1960.8.16 1 perforated bone bead, possibly from a necklace, from West Kennet Long Barrow, Avebury, Wiltshire, excavated by Professor Stuart Piggott and his staff and students at the Department of Prehistoric Archaeology at the University of Edinburgh, 1955-56. DZSWS:1960.8.17 2 perforated bone beads, possibly from a necklace, from West Kennet Long Barrow, Avebury, Wiltshire, excavated by Professor Stuart Piggott and his staff and students at the Department of Prehistoric Archaeology at the University of Edinburgh, 1955-56. DZSWS:1960.8.18 1 perforated bone bead, possibly from a necklace, from West Kennet Long Barrow, Avebury, Wiltshire, excavated by Professor Stuart Piggott and his staff and students at the Department of Prehistoric Archaeology at the University of Edinburgh, 1955-56. DZSWS:1960.8.19 2 bone pins, 1 perforated, from West Kennet Long Barrow, Avebury, Wiltshire, excavated by Professor Stuart Piggott and his staff and students at the Department of Prehistoric Archaeology at the University of Edinburgh, 1955-56. DZSWS:1960.8.20 1 bone pin, from West Kennet Long Barrow, Avebury, Wiltshire, excavated by Professor Stuart Piggott and his staff and students at the Department of Prehistoric Archaeology at the University of Edinburgh, 1955-56. DZSWS:1960.8.21 1 bone pin, from West Kennet Long Barrow, Avebury, Wiltshire, excavated by Professor Stuart Piggott and his staff and students at the Department of Prehistoric Archaeology at the University of Edinburgh, 1955-56. DZSWS:1960.8.22 1 polished bone scoop, from West Kennet Long Barrow infilling, Avebury, Wiltshire, excavated by Professor Stuart Piggott and his staff and students at the Department of Prehistoric Archaeology at the University of Edinburgh, 1955-56. DZSWS:1960.8.23 1 polished and burnt bone scoop, from West Kennet Long Barrow infilling, Avebury, Wiltshire, excavated by Professor Stuart Piggott and his staff and students at the Department of Prehistoric Archaeology at the University of Edinburgh, 1955-56. DZSWS:1960.8.24 1 chalk bead, pierced in 3 places, broken, from West Kennet Long Barrow infilling, Avebury, Wiltshire, excavated by Professor Stuart Piggott and his staff and students at the Department of Prehistoric Archaeology at the University of Edinburgh, 1955-56. DZSWS:1960.8.25 1 crescent shaped, discoidal flint scraper, from West Kennet Long Barrow infilling, Avebury, Wiltshire, excavated by Professor Stuart Piggott and his staff and students at the Department of Prehistoric Archaeology at the University of Edinburgh, 1955-56. DZSWS:1960.8.26 1 crescent shaped, discoidal flint scraper, from West Kennet Long Barrow infilling, Avebury, Wiltshire, excavated by Professor Stuart Piggott and his staff and students at the Department of Prehistoric Archaeology at the University of Edinburgh, 1955-56. DZSWS:1960.8.27 1 semi crescent shaped flint scraper, from West Kennet Long Barrow infilling, Avebury, Wiltshire, excavated by Professor Stuart Piggott and his staff and students at the Department of Prehistoric Archaeology at the University of Edinburgh, 1955-56. DZSWS:1960.8.28 1 semi crescent shaped flint scraper, from West Kennet Long Barrow infilling, Avebury, Wiltshire, excavated by Professor Stuart Piggott and his staff and students at the Department of Prehistoric Archaeology at the University of Edinburgh, 1955-56. DZSWS:1960.8.29 1 neolithic Peterborough Ware pottery sherd decorated by pushing small animal bones into the clay, from West Kennet Long Barrow, Avebury, Wiltshire, excavated by Professor Stuart Piggott and his staff and students at the Department of Prehistoric Archaeology at the University of Edinburgh, 1955-56. DZSWS:1960.8.30 1 neolithic Peterborough Ware pottery sherd decorated by pushing small animal bones into the clay, from West Kennet Long Barrow, Avebury, Wiltshire, excavated by Professor Stuart Piggott and his staff and students at the Department of Prehistoric Archaeology at the University of Edinburgh, 1955-56. DZSWS:1960.8.31 1 neolithic Peterborough Ware pottery sherd decorated by pushing small animal bones into the clay, from West Kennet Long Barrow, Avebury, Wiltshire, excavated by Professor Stuart Piggott and his staff and students at the Department of Prehistoric Archaeology at the University of Edinburgh, 1955-56. DZSWS:1960.8.32 1 neolithic Peterborough Ware pottery sherd decorated with dots and zig-zags inside and around the rim and neck, from West Kennet Long Barrow, Avebury, Wiltshire, excavated by Professor Stuart Piggott and his staff and students at the Department of Prehistoric Archaeology at the University of Edinburgh, 1955-56. DZSWS:1960.8.33 1 neolithic Peterborough Ware pottery sherd, undecorated, black with slight ridge, from West Kennet Long Barrow, Avebury, Wiltshire, excavated by Professor Stuart Piggott and his staff and students at the Department of Prehistoric Archaeology at the University of Edinburgh, 1955-56. DZSWS:1960.8.34 1 neolithic Peterborough Ware pottery sherd, black with brushed lines around the neck and chevrons around the shoulders, from West Kennet Long Barrow, Avebury, Wiltshire, excavated by Professor Stuart Piggott and his staff and students at the Department of Prehistoric Archaeology at the University of Edinburgh, 1955-56. DZSWS:1960.8.35 1 neolithic Peterborough Ware pottery sherd, decorated with diagonal grooves and fingernail impressions, from West Kennet Long Barrow, Avebury, Wiltshire, excavated by Professor Stuart Piggott and his staff and students at the Department of Prehistoric Archaeology at the University of Edinburgh, 1955-56. DZSWS:1960.8.36 1 neolithic Peterborough Ware pottery sherd, decorated with bands of fingernail impressions, from West Kennet Long Barrow, Avebury, Wiltshire, excavated by Professor Stuart Piggott and his staff and students at the Department of Prehistoric Archaeology at the University of Edinburgh, 1955-56. DZSWS:1960.8.37 1 neolithic Peterborough Ware pottery vessel partly reconstructed, decorated with finger pinched marks all over the body and bird bone impressions around the rim, from West Kennet Long Barrow, Avebury, Wiltshire, excavated by Professor Stuart Piggott and his staff and students at the Department of Prehistoric Archaeology at the University of Edinburgh, 1955-56. DZSWS:1960.8.38 1 Neolithic Peterborough Ware pottery vessel, decorated with chevrons around the rim, from West Kennet Long Barrow, Avebury, Wiltshire, excavated by Professor Stuart Piggott and his staff and students at the Department of Prehistoric Archaeology at the University of Edinburgh, 1955-56. DZSWS:1960.8.135 1 groove ware pottery sherd decorated with finger impressions seperated by incised lines, from West Kennet Long Barrow, Avebury, Wiltshire, excavated by S Piggott, 1955-56. DZSWS:1975.59.1 5 large fragments of flint cores found with quantities of flint waste (around the long barrow) but no tools noticed, surface finds from Cold Kitchen Hill, Brixton Deverill, Wiltshire, 1975. DZSWS:1975.86.1 3 flint cores found with knapping debris that was not collected as described in Gingell's notes, from the Neolithic period, found south of the long barrow on Easton Down known as Bishops Cannings Barrow, Bishops Canning, Wiltshire. DZSWS:1975.86.2 1 flint side scraper, from the Neolithic period, found south of the long barrow on Easton Down known as Bishops Cannings Barrow, Bishops Canning, Wiltshire. DZSWS:1975.86.3 1 flint piercer from the Neolithic period, found south of the long barrow on Easton Down known as Bishops Cannings Barrow, Bishops Canning, Wiltshire. DZSWS:1975.87 1 flint scraper manufactured from a waste flake, from the Neolithic period, found on the surface of a ploughed field in the parish of Bishops Cannings, Wiltshire. DZSWS:1975.96.1 4 flint piercers from the edge and ditchfill of a ploughed out longbarrow from the Neolithic period, from Horton Down Long Barrow, Bishops Cannings, Wiltshire. DZSWS:1975.96.2 1 flint end scraper from the Neolithic period, from Horton Down Long Barrow, Bishops Cannings, Wiltshire. DZSWS:1975.96.4 19 flint cores from tool manufacturing industry, from the Neolithic period, from Horton Down Long Barrow, Bishops Cannings, Wiltshire. DZSWS:1975.96.5 19 flint waste flakes, some show signs of re-working, from the Neolithic period, from Horton Down Long Barrow, Bishops Cannings, near Deivizes, Wiltshire. DZSWS:1976.2.1 1 flint core from the tool production process, from the Neolithic period found at Preshute, Marlborough, Wiltshire. DZSWS:1976.2.2 10 waste flint flakes from the Neolithic period found at Preshute, Marlborough, Wiltshire. DZSWS:1976.2.3 2 retouched flint flakes from the Neolithic period found at Preshute, Marlborough, Wiltshire. DZSWS:1976.2.4 2 flint scraping tools worked on waste flakes from the Neolithic period found at Preshute, Marlborough, Wiltshire. DZSWS:1976.19.1 7 assorted, multi-platform flint cores, from Arn Hill, Warminster, Wiltshire, collected by C J Gingell. DZSWS:1976.19.1.1 2 flint hammerstones, both well used, one broken, from Arn Hill, Warminster, Wiltshire, collected by C J Gingell. DZSWS:1976.19.2 1 small flint scraper, almost circular, worked on a small core flake, from Arn Hill, Warminster, Wiltshire, collected by C J Gingell. DZSWS:1976.19.3 3 flint core flakes, all fairly crude, pressure flaked to form 'end' scrapers, from Arn Hill, Warminster, Wiltshire, collected by C J Gingell. DZSWS:1976.19.4 2 pices of flint waste flakes, each with signes of some working, possibly used as scraping tools of some sort but exact use not decipherable, from Arn Hill, Warminster, Wiltshire, collected by C J Gingell. DZSWS:1976.19.5 4 fragments of Sarsen stone, much weathered, from Arn Hill, Warminster, Wiltshire, collected by C J Gingell. DZSWS:1976.19.6 6 sherds of undated, but prehistoric, pottery, from Arn Hill, Warminster, Wiltshire, collected by C J Gingell. DZSWS:1976.95 1 sherd of Bronze Age pottery with cord impressions, from Tow Long Barrow, Grafton, Wiltshire. DZSWS:1982.70 1 finely made, backed, flint bladelet, from the centre of the long edge of the barrow at Long Barrow, Winterbourne Stoke, Wiltshire. DZSWS:1982.1902 Crayon drawing, Long Barrow (Bowlsbarrow), Heytesbury, June 1886. DZSWS:1982.3420 Pen drawing on tracing paper, plan of W Kennet long barrow, c 1930. DZSWS:1982.4447 Signed pen drawing on linen, Manton Downs. Dog Hill. Long barrow with ruined megalithic tomb. Plan and cross section, scale 1'=1/4", July 1921, by Lawson, A H, and Passmore, A D.
DZSWS:1982.7355 Pen and wash drawing, Lugbury Long barrow, ground plan, scale 30'=1", 1822, by Crocker, P.
DZSWS:1982.7356 Pencil and watercolour drawing, Lugbury Long barrow, 1822, by Crocker, P.
DZSWS:1982.7357 Pencil and watercolour drawing, Lugbury Long barrow, 1822, by Crocker, P.
DZSWS:1982.7358 Pencil and watercolour drawing, Lugbury Long barrow, interior view of section, 1822, by Crocker, P.
DZSWS:1982.7359 Pencil and watercolour drawing, Lugbury long barrow, 1822, by Crocker, P.
DZSWS:1982.7362 Pencil drawing on tracing paper, Long Barrow (Bowlsbarrow), plan of situation, c 1920, by E H Stone. 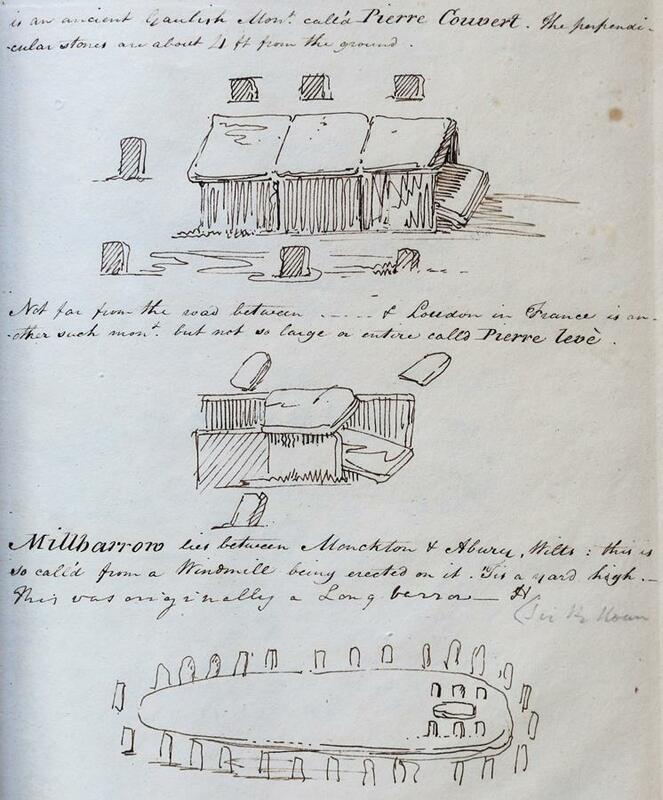 DZSWS:1982.7453 Pen drawing, Winterbourne Monkton, Long Barrow (Millbarrow) c 1814, by E H Meredith after J Aubrey 17th cent. DZSWS:1982.7454 Pen drawing, Lugbury Long barrow, c 1814, by Meredith, E H, after J Aubrey, 17th cent. 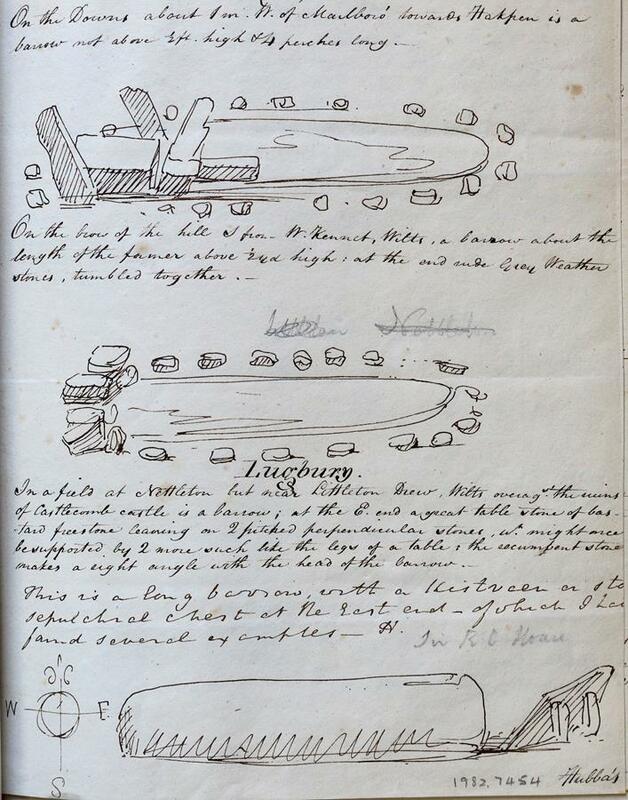 DZSWS:1982.7456 Pen drawing, Lanhill long barrow, (Hubba's Low), c 1814, by E H Meredith, after J Aubrey, 17th cent. DZSWS:1982.7459 Pen drawing, Lugbury Long barrow, from S, c 1840, by John Britton. DZSWS:1982.7788 Watercolour of a long barrow, c 1820. DZSWS:1982.7805 Pen and wash drawing, Winterbourne Monkton, Long Barrow (Milbarrow) c 1720, by Wm Stukeley. DZSWS:1982.8023 Pen drawing, Nettleton, megalithic tomb at E end of long barrow. Elevation and plan, c 1805, by Sir R C Hoare. DZSWS:1982.8024 Pen drawing, Shalbourne, Botley Down, Plan showing location of long barrow, c 1805, by Sir R C Hoare. DZSWS:1983.8535 Photograph, Dr Shaw-Mellor during excavation of West Kennet Long Barrow, with Stuart Piggott(?) Avebury, Wiltshire 1955. DZSWS:1984.9008 Photograph, interior of West Kennet Long Barrow, Avebury, Wiltshire. DZSWS:1985.183.1 Antler pieces from the excavations of the neolithic long barrow at Cold Kitchen Hill, Kingston Deverill, Wiltshire by F de M and HFW Vatcher, 1964. DZSWS:1985.183.2 Antler pieces from the excavations of the neolithic long barrow at Cold Kitchen Hill, Kingston Deverill, Wiltshire by F de M and HFW Vatcher, 1964. DZSWS:1985.183.3 Antler pieces from the excavations of the neolithic long barrow at Cold Kitchen Hill, Kingston Deverill, Wiltshire by F de M and HFW Vatcher, 1964. DZSWS:1985.183.4 2 antler pieces from the excavations of the neolithic long barrow at Cold Kitchen Hill, Kingston Deverill, Wiltshire by F de M and HFW Vatcher, 1964. DZSWS:1985.183.5 1 antler tip from the excavations of the neolithic long barrow at Cold Kitchen Hill, Kingston Deverill, Wiltshire by F de M and HFW Vatcher, 1964. DZSWS:1985.183.6 1 antler piece from the excavations of the neolithic long barrow at Cold Kitchen Hill, Kingston Deverill, Wiltshire by F de M and HFW Vatcher, 1964. DZSWS:1985.183.7 3 antler fragments from antler in 10' baulk from the excavations of the neolithic long barrow at Cold Kitchen Hill, Kingston Deverill, Wiltshire by F de M and HFW Vatcher, 1964. DZSWS:1985.183.8 4 pieces of antler and one tooth from the excavations of the neolithic long barrow at Cold Kitchen Hill, Kingston Deverill, Wiltshire by F de M and HFW Vatcher, 1964. DZSWS:1985.183.9 8 pieces of antler and one tooth from the excavations of the neolithic long barrow at Cold Kitchen Hill, Kingston Deverill, Wiltshire by F de M and HFW Vatcher, 1964. DZSWS:1985.183.10 1 bag of charcoal from the excavations of the neolithic long barrow at Cold Kitchen Hill, Kingston Deverill, Wiltshire by F de M and HFW Vatcher, 1964. DZSWS:1985.183.11 1 bag of charcoal from the excavations of the neolithic long barrow at Cold Kitchen Hill, Kingston Deverill, Wiltshire by F de M and HFW Vatcher, 1964. DZSWS:1985.183.12 1 bag of charcoal from the excavations of the neolithic long barrow at Cold Kitchen Hill, Kingston Deverill, Wiltshire by F de M and HFW Vatcher, 1964. DZSWS:1985.183.13 1 bag of charcoal from the excavations of the neolithic long barrow at Cold Kitchen Hill, Kingston Deverill, Wiltshire by F de M and HFW Vatcher, 1964. DZSWS:1985.183.14 1 bag of charcoal from the excavations of the neolithic long barrow at Cold Kitchen Hill, Kingston Deverill, Wiltshire by F de M and HFW Vatcher, 1964. DZSWS:1985.183.15 1 bag of charcoal from the excavations of the neolithic long barrow at Cold Kitchen Hill, Kingston Deverill, Wiltshire by F de M and HFW Vatcher, 1964. DZSWS:1985.183.16 1 bag of charcoal from the excavations of the neolithic long barrow at Cold Kitchen Hill, Kingston Deverill, Wiltshire by F de M and HFW Vatcher, 1964. DZSWS:1985.183.17 1 bag of charcoal from the excavations of the neolithic long barrow at Cold Kitchen Hill, Kingston Deverill, Wiltshire by F de M and HFW Vatcher, 1964.